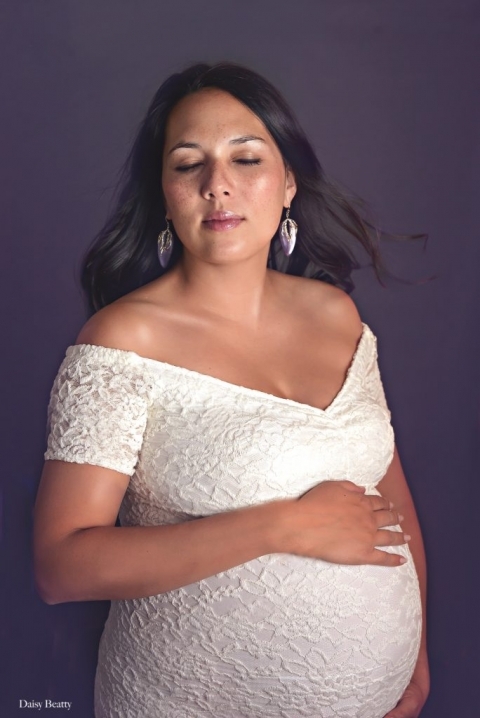 Maternity sessions capture some of the most special portraits. Pregnancy photography is an extremely popular genre: it captures such a unique time in a woman’s life, and something that should be celebrated, and preserved forever. The shoots are empowering and relaxed, and a fun excuse to pamper yourself during your pregnancy. To answer the most common maternity photography question: I provide wardrobe and retouching. Both are optional, but available if you want them. I specialize in Hamptons and NYC maternity photography, but am always happy to travel. I often work in Greenwich, CT, Westchester, NJ and Boston; you get the idea. I work outdoors, and in a studio in Manhattan. Here’s an example of an outdoor NYC maternity shoot. Here’s an example of a Hamptons maternity shoot. Here’s an example of a NYC studio maternity shoot. Here’s an example of a milk bath maternity shoot. Here’s an example of a maternity shoot on the Connecticut coast. Some clients like to do both locations: in studio and outdoor. This is a great way to capture different locations, and to have a portraits just of yourself, and with your family. However, sticking with one location is a wonderful option too. Studio maternity photography is wonderful – and a super option all year round! Here’s an example of a client who did a studio maternity shoot in NYC followed by a family beach session in Greenwich CT. The best time for your maternity session is typically when you are 28 – 35 weeks along. You want to be far enough along that you are really showing, but still feeling comfortable and able to move around a bit. Of course, another reason you also don’t want to leave it to the last minute is in case your baby comes a couple weeks early! The beauty of a studio shoot is that it can be done at any time. No need to worry about the lighting or the weather. I have lots of fabric, clothing, lighting, and backdrops at my Greenwich Village studio. Of course, I absolutely love doing outdoor and beach shoots. Those are typically best around sunrise and sunset. NYC, the Hamptons and the surrounding areas offer tons of wonderful outdoor options. Milk Bath maternity photography is such a creative, fun, and relaxing way to show off your form. I typically do these shoots in Greenwich Village Manhattan. Creative milk bath photography is a unique and beautiful way to document and celebrate your pregnancy. What are your favorite flowers? Let’s design a shoot just for you. NYC milk bath photography is becoming one of my favorites! And – bonus – your skin will feel fabulous afterwards. A win win. Wardrobe is such an important and transformative part of the photo shoot, and you have complete control over how you want your session to be styled. Whether you do a maternity photography nyc studio session, or an outdoor shoot, wardrobe choices are important, and something we can discuss before you have your portraits taken. You can wear your own clothes, pick from my maternity wardrobe, or wear nothing at all. It’s entirely up to you. Many clients do a mix of all three. As a nyc pregnancy photographer I have collected many pieces you can wear during the shoot, and I’m happy to point you to some of my favorite vendors if you want to browse there too. I also love that Rent The Runway now has “bump friendly” maternity clothes. That has been a great option for some clients. If you haven’t used Rent The Runway before, you can use click my code to get $30 off your first order. One of the most common questions/concerns that people have is wondering if I am willing to retouch your images. If you’d like me to slim you, clean up your skin, make your hair slightly fuller, your teeth slightly whiter, etc. I’m more than happy to do any of those things. Flattering posing and lighting is a big part of getting a beautiful maternity portrait, but a little retouching in postproduction can go a long way. I’m an experienced retoucher and I really enjoy the process. The key is too keep the retouching gentle and natural. Here’s a finished image (above), and below is the unretouched original (shared with permission). I liked the location and pose, but didn’t like the telephone pole coming out of the subject’s shoulder, and obviously the image is too dark. The beautiful woman is in the shadows. I slimmed the subject slightly (hips and arms) and brightened the image. If this of interest, or if you have any questions, by all means let me know. Maternity portraits capture such an exciting time in your life. You can rest assured that my knowledge of lighting, posing, and gentle retouching will capture you looking your absolute best. There isn’t much you have to do to prep for these shoots specifically, but following the general pointers below can make for an even better experience. Most of these tips are applicable to any sort of shoot, not just pregnancy photography. Read below for maternity portrait tips! • If you wear any rings (or any jewelry at all), polish them the day before the shoot. A jeweler will do the best job cleaning your jewelry, but some home cleaners clean things up nicely too. I like this jewelry cleaner from Amazon (don’t put pearls in that!). Best bet though is to bring your jewelry to a jeweler, especially the one(s) who sold the pieces to you. • If you usually tan, be sure to do it a few days in advance. A tan is certainly not required! • Pregnancy can do unexpected things to skin – don’t worry! If you have anything you feel self conscious about, just let me know. Posing, lighting, and retouching can work wonders. I don’t want you feeling preoccupied during your shoot! • Please wear a bandeau bra, or no bra to your shoot: something that won’t leave lines on your skin. As you change into different ensembles, you don’t want visible marks from a bra on your skin. • No chapped lips. Brushing your lips with a dry toothbrush for a few nights before your shoot helps exfoliate them. • If you are going to thread or wax your eyebrows, be sure to do it a couple of days before your shoot. • Some people like to get their makeup done professionally before the shoot. Again, this isn’t required, but it can be fun to pamper yourself before your shoot. Many of my clients have used GlamSquad and they have all had good experiences. GlamSquad comes to you at your home, office, hotel, etc. • A professional blowout can be great for a shoot. If you are choosing between getting your hair done or your makeup, I think hair is definitely more important. I like Dry Bar; or you can have the aforementioned GlamSquad come to you. You can use that GlamSquad link and save $25 on your service with them. In the Hamptons, I like Blow Beauty Bar in Bridehampton or Warren Tricomi in East Hampton. GlamSquad is also offers summer service in the Hamptons. I often get asked about whether or not your maternity portraits will be retouched. The short answer is yes. I “photoshop” all the final images from your shoot. This can range from removing distractions from the background and brightening the image, to retouching blemishes in your skin, doing some gentle slimming. I’m happy to discuss your preferences beforehand. I am an experienced retoucher, and really enjoy doing it. The key is keeping it natural! The main point, for a client, is that you should relax and have fun during your maternity session. Trust that between the lighting, posing, and editing, you are going to look your most fabulous! Who Should Come to a Maternity Shoot? It’s always great to incorporate your significant other into some of your maternity shoot. Many clients do some pregnancy portraits with their significant other, and then some solo. Same goes for children. It’s nice to have a combination. If you bring a small child, please bring an additional person to watch the child (or take him/her home) when they aren’t being photographed. If you want tips on how to prepare for a family photo shoot, click here. Who Should Get Pregnancy Photos? It can be your first pregnancy, or your fifteenth. Take some time to celebrate all that your body is doing, and the exciting new family member on the way. Some of my clients come for every pregnancy. It’s so special to watch their family grow, and an honor to be trusted to work with them again and again. Some come for maternity portraits for their second pregnancy because they regret not doing it for their first. It really is for everyone: any age, any pregnancy. Want pregnancy portraits of your own? Daisy Beatty is a portrait photographer based in Manhattan and East Hampton NY. In addition to maternity photography nyc she specializes in vibrant images of families, children, newborn, pregnancy, and headshots.